DETEXI NVR records video using proprietary file format but enables users to export recorded video to the standard file format — AVI (Audio Video Interleave. DETEXI Client Archive Tool and Archive Viewer export video to AVI file format. Video in the proprietary file format can also be exported along with a proprietary player — restricted DETEXI Archive Viewer. 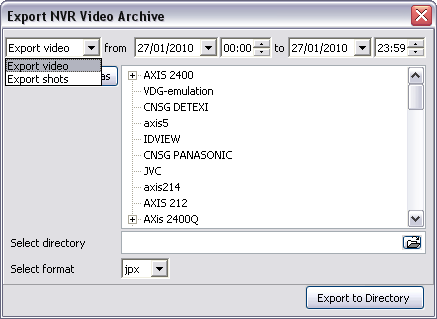 Export NVR Video Archive module included automatically with the DETEXI NVR installation allows users to export, or back up the recorded video. The advantages of using the native recording format are — additional security and data integrity as well as advanced playback features. Additionally, the proprietary format is more difficult to edit and can be used to preserve the chain of evidence. To learn more refer to the DETEXI NVR — Access NVR Video Archive.